TelecomMap is now out of Beta! It was in September 2011 that we launched TelecomMap.com, a site to help you to rate your 3G operator on a map. Since then we have been receiving good number of reports and suggestions from you. After few days of testing new things, we decided to come out of beta stage. Now TelecomMap bears a new refreshing look and submitting reports has become more easier. Taking a cue from your suggestions, we have enabled submission of EVDO network reports. Once 4G is launched feel free to add reports to the 4G section too. 1.Use the Submit a Report option available at TelecomMap. 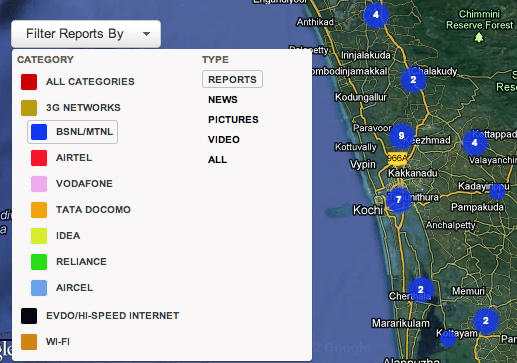 3.Email a report to report [ @ ] telecommap.com. While submitting reports take care to provide locality details in your report. If you just write Reliance 3G is present in Mumbai, it proves to be less valuable to a person looking for 3G services in a particular area in Mumbai. In addition to this there is a possibility of your report drawing an operator’s attention who may in turn consider improving the service by installing an additional tower! We also encourage you to submit Speedtest result images so that your claims can be verified by other users. How TelecomMap can make a difference? 1.Once a reader submits a report, it will go live after a while. This is because reports will be moderated to avoid spam. 3.The Get Alerts feature can alert you when a new service is available in your area. Soon we will be introducing the facility to submit reports by SMS and by apps for Android and iOS. We would like to thank all our readers who took time to submit informational reports at TelecomMap and also the entire Telecomtalk team who strived hard to bring Telecommap to this stage today. Do let us know your opinions about the new TelecomMap via comments. To receive short timely updates follow TelecomMap on twitter. Please note that this can happen only if someone submits a report about the service. Nice move… team east or west u r the best guys….!!!!!!!!!!!!!! Airtel 4g launching tomorrow in kolkata by kapil sibal.